From 1980–2012, I used my brain for tracking all due dates, and to-do items. Of course, this is the most common system used by humans to do these things. It’s also arguably the worst system for doing it. The human brain (or at least my human brain) is just not good at keeping more than a handful of items in quick-retrieval, short-term memory. Looking back on the first 32 years of my life, I’m frankly amazed that I did as good a job as I did using my wetware-based system. Which is not to say that it was anywhere near perfect. But that’s the problem with using your brain to do this kind of thing: You don’t even know what you might be forgetting. At some point in 2012, I watched this video by CGP Grey. The second half was never resonant with me (it’s just not how I ran that side of teaching), but the first half struck a chord. Grey’s system as he presents it is paper-based, but as a heavy Evernote user, it was trivial to move it to a notebook. While I’ve moved on to other systems since this one, I’ll always remember how using a system like this one was like flipping a light switch as far as showing me the value of an external task management system. Seemingly overnight, I was staying on top of the various tasks that needed my attention in a whole new way. I also never had the tension that comes with needing to store some task in my working memory. While I had never thought that my student record management or family communication processes were lacking before using this system, after implementing it, I realized that I was operating on an entirely different level and that my students and my working life were benefiting tremendously from the change. After reading this book, I decided to revise my task management system to be a bit more flexible than the Grey system (itself a “lite” version of the system described in GTD). I spent two years using OmniFocus, which is far more robust than anything I ever needed, but it allowed me to do what I wanted to do easily. With the move away from dedicated Mac ecosystems in school, I then transitioned things over to ToDoist and used it long enough to max out its karma function. Platform aside, both of these programs are the same approach: Using a program designed from the ground-up for the sole purpose of handling task management. They represent perhaps the most singularly task-management-focused approach that I have employed. And that system worked well until it didn’t anymore. When I became an administrator, I initially kept using ToDoist for my task management. And it worked fine, most of the time. But with the change in job came a change in the structure of my day and a notable increase in the number of meetings and appointments that I needed to stay on top of. It quickly became apparent that using one place to handle my meetings, and another to handle my tasks was twice as many places to pay attention to as I wanted to (or could with anything approaching the kind of dogmatic fidelity I need to feel like I’m staying on top of things). I also happened to read several articles like this one, demonstrating that using the calendar as the sole place for task management might be the optimal approach for what I need. 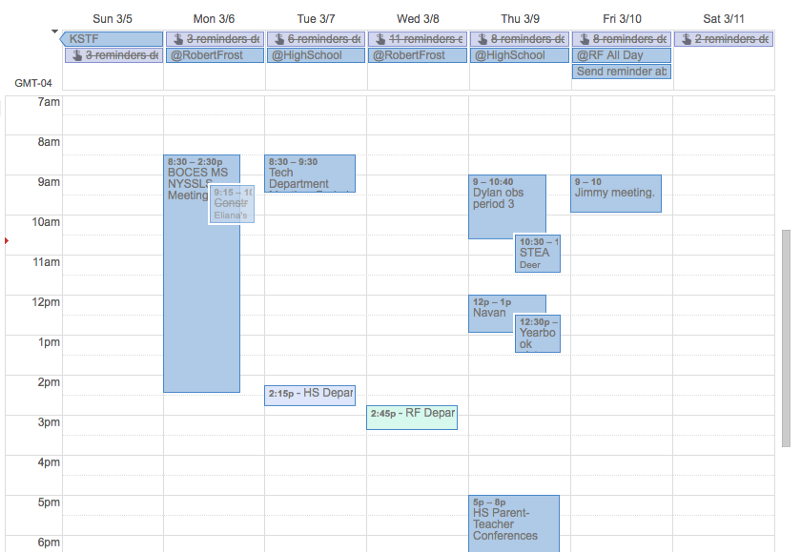 This is made all the easier by the fact that Google has kindly brought reminder functionality to Google Calendar, which lets me put my non-meeting-based tasks onto my calendar in a way where I can visually delineate among my different events. It’s a great solution for what I need, and at this point, I’d never use anything else unless I had to. A recent week’s view on my calendar. Reminders cycle to the top of the day as they are completed, but can be scheduled throughout the day, as necessary. I wrote this piece because I thought it might be useful. In the main, I hope it helps to explain the kinds of systems that administrators should consider using to manage all of the tasks that occupy their working life. I simply can not imagine what this job would be like if I tried to keep everything in my brain. Frankly, I have a hard time seeing how anyone who took the brain-based approach to administrative task management could be even remotely good at it. On another level, I think that recounting my history of task-management approaches helps to illustrate both a variety of approaches to the task (pun acknowledged, and regretted) and that the specific process that might best work is going to depend on the needs of the individual and the requirements of the position. I don’t intend to suggest that any of the ways that I have gone about my task management is the “best” way, only that they have been useful for me. Maybe they’ll be useful for you, too. Do you have another approach to task management? Let me know. Also, remember that I don’t write during vacations, so look for the next post after our imminent Spring Break. Have a great week!